The nondescript area between Central Market and Medan Pasar, known as the “Bangkok Bank bus stop”, where those pink mini buses that plied the city’s streets converged. This was its hub. Those mini terrors are long gone but the old public transport hub ― surrounded by pre-World War II shop houses ― is having a moment right now. A group of town planners has transformed this location, positioned in front of Bangkok Bank, into a parklet that also serves as a library for those living in the neighbourhood. Named Lanai (meaning open veranda), it was designed by the Malaysian Institute of Planners in conjunction with the World Urban Forum 9, which took place in Kuala Lumpur early last month. The institute said the response from the public was overwhelming, encouraging them to source for funds to make it permanent. 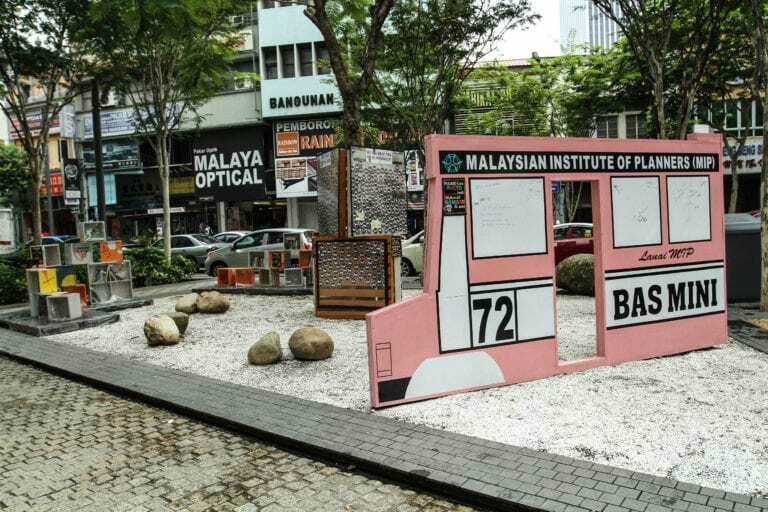 Project coordinator Juwairiyah Ho told Malay Mail the institute spent RM20,000, mostly contributed by its own members, to develop the parklet. It now needs up to RM50,000 more to make the place permanent. Currently, the open space which was formerly empty with a single tree in the middle, has a series of plastic-covered shelves with some English and Malay books donated by members and volunteers. These range from novels to children’s books. On the day we were there, some of the shelves were empty — evidence the books had been taken home. “We don’t want to impose on them when to return the books. Some of them are shy to read out in the open,” Juwairiyah said. But the books were returned. And that is one of the key reasons the institute wants to make Lanai permanent. In the early days of the project, there was concern the books would go missing. Permanently. But that was not the case. Without a “librarian” supervising who can take the books and for how long, the books were taken home, read and returned. “We have changed the perception of people on the behaviour of the less privileged … we ourselves are surprised the books and bookshelves are still ‘intact’ and not vandalised,” Juwairiyah said. Yes, except for taking a beating from the occasional heavy thunderstorm the parklet has not been vandalised at all. The institute is now seeking funds to erect permanent fixtures such as shaded sitting areas as opposed to the “sitting rocks”. It also needs stronger shelves with properly labelled books. Juwairiyah said the parklet provides a positive experience for children from less privileged communities, as they can use it as a library without protocols. “This is what we call social inclusiveness ― whereby the space is for all without discrimination,” she said. One of the unexpected hits with visitors to the area is the replica of the pink mini bus! Tourists think it is cute and for those who remember and used the buses “it is a nostalgic reminder of a time when this was ‘the most happening’ place in KL”, said Juwairiyah. The institute is hoping that with additional funds, it can design a better replica of the mini bus, complete with a time line of the location’s history and an information panel. Currently, it is seeking City Hall’s permission to continue maintaining the space until the World Library and Information Congress which takes place in Kuala Lumpur in August. “We think it will be good to have this on display when the congress takes place,” the institute’s council member Abdul Hamid Akub said.